A proposed plan to lessen agricultural pollution entering Lake Apopka until comprehensive guidelines were established by the State of Florida. The plan aimed at more accurately measuring water inflow and outflow to the muck farms, using gauges installed at each pump site. The pumpage data was to then be correlated with rainfall and other hydrological measures to determine an accurate water budget for the muck farms. The plan also called for a lessening of fertilizer use by the farms, and stated that implementing these steps should be the responsibility of the muck farms and the Central Florida Agricultural Institute. Lake Apopka is one of Florida’s largest lakes and was once considered to be one of the world’s best lakes for bass fishing. The lake’s sport fish population began to decline in the 1960s, with major die-offs occurring almost yearly. The lake’s problems are generally considered to be the result of over-nutrification from various sources. Twenty thousand acres of wetlands bordering the lake’s north shore were drained in the 1940s and used for highly fertile "muck farms." These farms were routinely flooded to protect the fragile soil, and the fertilizer and pesticide-laden water was then discharged back into the lake prior to each growing season. Other sources of pollution include discharge from citrus processing operations, as well as treated wastewater from sewage plants. The nutrient-rich discharge promoted algae growth in the lake, turning the water to a green color, and blocked sunlight from reaching aquatic vegetation, which provided food and habit to the lake’s fish population. The lake’s bottom soil became increasingly "mucky," also disrupting aquatic vegetation from taking root. Restoration work on the lake began in the 1960s with attempts by various agencies to remove "trash fish," such as gizzard shad, from the lake via seining, which would hopefully allow the lake’s sportfish to thrive. The Lake Apopka Restoration Council, an initiative formed under Governor Claude Kirk (1926-2011) in 1967, launched several studies to find methods to improve the lake, though no serious action was taken. Various methods were debated to restore the lake through the 1970s and 1980s, including "drawdown," which entailed completely draining the lake to allow the mucky bottom to consolidate. Restoration attempts were stalled for lack of funding and research. Original 6-page typewritten abatement plan, February 2, 1972: binder 1972, Friends of Lake Apopka Archives, Ginn Museum, Oakland Nature Preserve, Oakland, Florida. 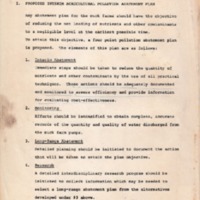 Digital reproduction of original 6-page typewritten abatement plan, February 2, 1972. Binder 1972, Friends of Lake Apopka Archives, Ginn Museum, Oakland Nature Preserve, Oakland, Florida. "History of Lake Apopka." St John's River Water Management District. January 28, 2013. Accessed June 05, 2016. http://www.sjrwmd.com/lakeapopka/history.html. “Proposed Interim Agricultural Pollution Abatement Plan.” RICHES of Central Florida accessed April 22, 2019, https://richesmi.cah.ucf.edu/omeka/items/show/7522.